We’ve reached the celebration of the celebration, the extra level, the bonus game – This is the moment where the euphoria kicks in and the emotional moments of football are created. Nike presents the Euphoria Mode which is the latest chapter of the Game killer’s journey. The Euphoria Mode brings us to the final stages of the Champions League. This is where the top players of the game are and they’re used to use their Speed and Precision to end the game, making them worthy of playing at this level. The hype is unreal, the energy is definite, and the glory is only a goal away. Become victorious in the hunt for the ultimate trophy. The Nike Euphoria Mode captures the feelings after the amazing goal, the brilliant display of skill or the game changing save. 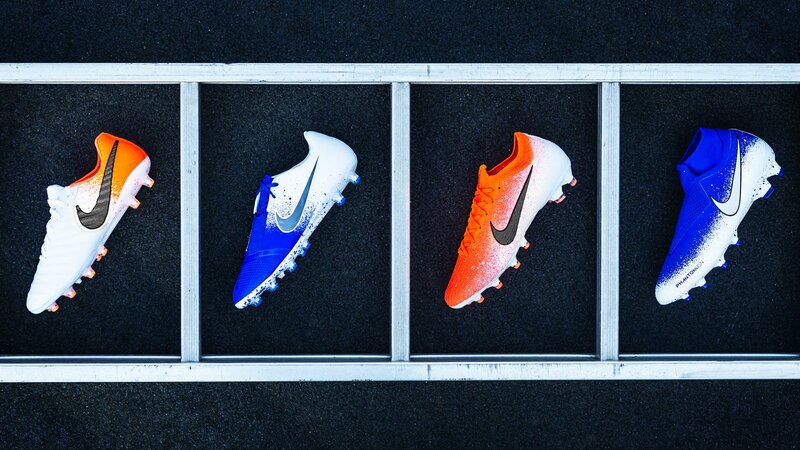 This is displayed by turning the Mercurial and Phantom Series into vibrant bursts of blue and red colourways. The graphical design of the boots is made as a spray paint pattern, that represents the energy of the crowd. The pattern is made with a fade that spreads across the boots, just like joy spreads through the crowd. The Euphoria Mode boots from the Mercurial is splashed with a red spray paint design, which fades from a full red upper into a white sole with red dots. The Mercurial boot are surely going to make Ronaldo, Sané, Dembele and the rest of the Mercurial squad glow up during the important matches in the Champions League, as they all hunt the feeling of Euphoria, while scoring the decisive goal. As always the Mercurial Silo will have it’s side kick, the Nike Tiempo Legend, made with the same colourway, which offers you a classic look and a great touch through it’s awesome leather upper. The Phantom Series might not have looked this good before, as the blue spray paint design covers out the deadliest boots in the game. The Phantom Series is made just like the Mercurial Series, as the Phantom Venom and Vision comes with a blue design rather than the red. We can’t wait to see the awakening of the Phantom such, as Kane, De Bruyne and Coutinho during the last stages of the Champions League campaign. The Nike Euphoria Mode is going to be available exclusively at Unisport from Monday the 15th of April 9 AM CET, while some of the best players of the Champions League tournament will use the boots from the semi-finals hunting the iconic trophy. Shop Nike Euphoria Mode Pack right here, right now.